Behavioral interviewing is a style of interview that provides the interviewee with scenarios to give examples of past behaviors. The goal with a behavioral interview is to allow the candidate to address both strengths and weaknesses based on their past job experience. The following is a list of my 301 Best Behavioral Interview Questions. For best results, this list can be combined with the use of a behavioral job profile and personality assessment, such as the Predictive Index and PRO. If you are interested in a free demo of the Predictive Index or Job Profile Tool Click Here to Request a Demo. As this is an extremely large comprehensive list, I have organized the questions Alphabetically by topic. You can use the following links to jump to a specific topic. Sign up for Blog Updates using the form on the right and get a copy of 301 Best Behavioral Interview Questions in a pdf download for Free. 1. Describe a situation when you or a group that you were a part of was in danger of missing a deadline. What did you do? 2. Describe some times when you were not very satisfied or pleased with your performance. What did you do about it? 3. In a supervisory or group leader role, have you ever had to discipline or counsel an employee or group member? What was the nature of the discipline? What steps did you take? How did that make you feel? How did you prepare yourself? 4. Tell me about a time when you failed to meet a deadline. What things did you fail to do? What were the repercussions? What did you learn? 5. Tell me about a time you had to confront a subordinate about a performance issue. 6. Tell of a time when you worked with a colleague who was not completing their share of the work. Who, if anyone, did you tell or talk to about it? Did the manager take any steps to correct your colleague? Did you agree or disagree with the manager’s actions? 7. By providing examples, convince me that you can adapt to a wide variety of people, situations and environments. 8. Describe previous situations that called for a radical change in the direction that you had chosen. What characteristics do you have to meet that challenge? 9. Tell of some situations in which you have had to adjust quickly to changes over which you had no control. What was the impact of the change on you? 10. Based on your previous position, give an example of a suggestion you made that really affected profitability. 11. Tell me about a situation in which you had to adjust to changes over which you had no control. How did you handle it? 13. There are times when we work without close supervision or support to get the job done. Tell me about a time when you found yourself in such a situation and how things turned out. 14. What impact did you have in your last job? 15. What is the most competitive work situation you have experienced? How did you handle it? What was the result? 16. What is the riskiest decision you have made? What was the situation? What happened? What did you learn from it? 17. What kinds of challenges did you face on your last job? Give an example of how you handled them. 18. What projects have you started on your own recently? What prompted you to get started? 19. What sorts of things have you done to become better qualified for your career? 20. What was the best idea that you came up with in one of your previous jobs? How did you apply it? What was the result? 21. When you disagree with your manager, what do you do? Give an example. 22. When you have a lot of work to do, how do you get it all done? Give an example? 23. Please tell me about one or two unpopular decisions you have made. What were the positive and negative outcomes of those decisions? 24. Give me an example of when you took a risk to achieve a goal. What was the outcome? 25. Give an example of when your persistence had the biggest payoff. 26. Recall a time from your work experience when your manager or supervisor was unavailable and a problem arose. What was the nature of the problem? How did you handle that situation? What steps did you take to resolve the issue? 27. Sometimes it’s easy to get in “over your head”. Describe a situation where you had to request help or assistance on a project or assignment. 28. Tell me about a time that you demonstrated initiative? 29. Describe a situation when have you motivated yourself to complete an assignment or task that you did not want to do? 30. Describe the project or situation from a previous job that best demonstrates your analytic abilities. What was your role? 31. Developing and using a detailed step-by-step procedure is often very important in a job. Tell about a time when you needed to develop and use a detailed step-by-step procedure to successfully complete a project. Did you have to make adjustments? What were they? 32. Give a specific example of a time when you used good judgment and logic in solving a complex problem. 33. Give me an example of a problem you solved by working backwards from the result to the cause. 34. Relate a specific situation where you found it necessary to be extremely precise in your in order to complete the job. 35. Tell us about a time when you had to analyze information and make a recommendation. What kind of thought process did you go through? What was your reasoning behind your decision? 36. Tell me about a situation where you had to be very careful with details to measure an outcome and make recommendations or changes. 37. Tell me about a situation where you had to build new relationships quickly? 38. Tell me about a time when you had to win the respect of a manager or boss, what did you do, were you successful? What did you learn? 39. Give a specific example of a time when you had to address an angry customer. What was the problem and what was the outcome? What steps did you take to calm the situation and keep the customer relationship intact? 40. It is very important to build good relationships at work but sometimes it doesn’t always work. If you can, tell about a time when you were not able to build a successful relationship with a difficult person. What could you do differently in the future? 41. It is impossible to get along with everyone, tell me about a situation where you had to manage a relationship with someone you didn’t naturally get along with. What caused the friction? Why do you think you didn’t naturally get along? 42. What, in your opinion, are the key ingredients in guiding and maintaining successful business relationships? Give examples of how you made these work for you. 43. Tell me about a politically complex work situation that you had to manage or work in? What did you learn? 44. Tell us me about a situation when you demonstrated too much initiative? 45. Have you ever worked in a situation where the rules and guidelines were not clear? Tell me about it. How did you feel about it? How did you react? 46. Some people consider themselves to be “big picture people” and others are “detail oriented”. Which are you? Give an example of a time when you displayed this. 47. Tell us me about a situation when it was important for you to pay attention to details. How did you handle it? 48. Tell me about a time when you had to put the brakes on a project to make sure things stayed on track, describe the situation and the outcome. 49. Describe a time when you had to use your written communication skills to get an important point across. 50. Tell me about a time when you had to present on a topic you were unfamiliar with, what happened, how did it go? 51. Describe a situation in which you were able to use persuasion to successfully convince someone to see things your way? 52. Summarize a situation where you successfully persuaded others to do something or to see your point of view. 53. Tell me about a time when you had to use your presentation skills to influence someone’s opinion. 54. Give me an example of a time you had to persuade other people to take action. Were you successful? 55. Describe a situation in which you were able to effectively “read” another person and guide your actions by your understanding of their individual needs or values. 56. Describe a situation when you were able to strengthen a relationship by communicating effectively. What made your communication effective? 57. Describe a situation where you felt you had not communicated well. How did you correct the situation? What could you do differently in the future? 58. Describe a time when you were able to effectively communicate a difficult or unpleasant idea to a superior. 59. Give me an example of a time when you were able to successfully communicate with another person, even when that individual may not have personally liked you, or vice-a-versa. 60. Describe the most significant written document, report or presentation which you had to complete. 61. Give me an example of a time when you were able to successfully communicate with another person, even when that individual may not have personally liked you. 62. Have you ever had to “sell” an idea to your co-workers or group? How did you do it? Did they “buy” it? 63. How do you keep subordinates informed about information that affects their jobs? 64. How do you keep your manager informed about what is being done in your work area? 65. How do you go about explaining a complex technical problem to a person who does not understand technical jargon? 66. What approach do you take in communicating with people? 67. What kinds of communication situations cause you difficulty? Give an example. 68. Tell us about a recent successful experience in making a speech or presentation. How did you prepare? What obstacles did you face? How did you handle them? 69. Tell us about a time when you and your current/previous supervisor disagreed but you still found a way to get your point across. 70. Tell us about a time when you had to present complex information. How did you ensure that the other person understood? 71. Tell us about a time when you had to use your verbal communication skills in order to get a point across that was important to you. 72. Tell us about a time when you were particularly effective in a talk you gave or a seminar you taught. 73. Tell us about an experience in which you had to speak up in order to be sure that other people knew what you thought or felt. 74. Tell us me about a situation when you had to speak up (be assertive) in order to get a point across that was important to you. 75. Tell us me about a time in which you had to use your written communication skills in order to get an important point across. 76. What challenges have occurred while you were coordinating work with other units, departments, and/or divisions? 77. What have you done to improve your verbal communication skills? 78. How have you persuaded others through a document you created? 79. What are the most challenging documents you have done? What kinds of proposals have your written? 81. Describe a situation in which you had to arrive at a compromise or guide others to a compromise. 82. Describe a situation where others you were working with on a project disagreed with your ideas. What did you do? 83. How have you differed from your professors in evaluating your performance? How did you handle the situation? 84. Tell me about a time when a supervisor criticized your work. How did you respond? 85. Tell me about a demanding situation that required you to remain calm and composed. 86. Tell me about an emergency you have had to deal with in the past? 87. Tell me about a situation where you had to deal with someone who was completely irrational. How did you manage the situation? 88. Describe a time when you took personal accountability for a conflict. Why did you, and what was the outcome? 89. Tell me about a situation where you had to resolve a challenging conflict quickly, what steps did you take? 91. Describe a situation where you found yourself dealing with someone who didn’t like you. How did you handle it? 92. How would you evaluate your ability to deal with conflict? 93. Tell me about a major problem you recently handled. Were you successful in resolving it? 94. Describe some projects or ideas (not necessarily your own) that were implemented, or carried out successfully primarily because of your efforts. 95. Describe a time when you served as a project manager. 96. Give an example of when you had to work with someone who was difficult to get along with. Why was this person difficult? How did you handle that person? 98. How would you describe yourself in terms of your ability to work as a member of a team? 99. Tell me about a time when you worked with a person who did things very differently from you. How did you get the job done? Would you work with that person again if given the choice? 100. Think about a difficult boss, professor or other person. What made him or her difficult? How did you successfully interact with this person? 101. How do you handle problems with difficult customers? Give an example. 102. How do you go about establishing rapport with a customer? What have you done to gain their confidence? Give an example. 103. What have you done to improve relations with your customers? 104. Describe a situation where you went above and beyond for a customer. 105. Have you ever received a customer testimonial? What did it say? Can you provide a reference? 106. Discuss an important decision you have made regarding a task or project at work. What factors influenced your decision? 107. Everyone makes a bad decision once in a while. Give me an example of a decision you made that didn’t work out? What happened? 108. Give an example of a time when you feel you didn’t have enough information to make a decision. What did you do? 109. Give me an example of a decision you made that had a significant impact on the success of a project or business objective? 110. How quickly do you make decisions? 111. Sometimes it’s best to reevaluate a situation, give me an example of a time when you had to reevaluate a previous decision. What did you do? 112. Give me an example of a time when you made an unpopular decision. How did you get others to buy in? 113. What kind of decisions do you feel most comfortable making rapidly? Which others take time? 114. Describe a situation where you had to organize a team to get a complex project done. What steps did you take to ensure everything was completed? 115. Tell me how you go about delegating work? 116. Give me an example of a situation where you had to trust others to do important work. What did you do to keep on top of it and ensure the success? 117. Do you consider your management style macro or micro? Give examples. 118. Do you prefer to work on big picture ideas or do you like to dig into the details? Give examples. 119. Have the jobs you held in the past required little attention, moderate attention, or a great deal of attention to detail? Give examples. 120. How do you stay organized? 121. How do you keep your outlook or email organized? 122. How do you keep your business contacts organized? Can you show me an example? Look for well-organized phone contacts. 123. Tell me about a job or setting where great precision to detail was required to complete a task. 125. Give me an example of a time when you had to train someone on something complex. 126. Tell me about a time when you had to deliver constructive feedback. How did it go? 127. Give me an example of a situation where you had to conduct a training session. How did you plan it? How did it go? Did you document the process? 128. How would you describe your leadership style? 129. Do you consider yourself a coach or mentor? Give examples of how you have coached or mentored others. 130. Making efforts to listen to and understand the customer (both internal and external), anticipating customer needs and giving high priority to customer satisfaction. 131. Tell of the most difficult customer service experience that you have ever had to handle-perhaps an angry or irate customer. Be specific and tell what you did. What was the outcome? 132. Give me an example of a time you successfully calmed down an irate customer. Now, tell me about a time in which you were unsuccessful. 133. Tell of a time when your active listening skills really paid off for you – maybe a time when other people missed the key idea being expressed. 134. Give me a specific example of a time when a co-worker or classmate criticized your work in front of others. How did you respond? How has that event shaped the way you communicate with others? 135. When supervising others, there always will be unpleasant situations. Describe how you manage difficult employees. 136. What has been your experience in giving presentations to small or large groups? What has been your most successful experience in speech making? 137. Describe the last opportunity where you were able to discuss business in an informal social setting such as a party or a sporting event. 138. Give me an example of a time when you had to change direction on a major project. What happened? 139. Tell me about a time when you had to go along with a decision you didn’t agree with. How did you accommodate? 140. How do you keep track of complex projects? 141. How do you keep track of delegated tasks or assignments? 142. How do you conduct performance reviews? 143. How do you get the data to evaluate performance? 144. How do you keep track of what your direct reports are working on? 145. How do you go about setting goals? 146. Can you describe your long-range goals and objectives? 147. Describe what you’ve accomplished toward reaching a recent goal for yourself. 148. Give me an example of an important goal which you had set in the past and tell me about your success in reaching it. 149. Tell me about your plan for the next 5 years. 150. What are your standards of success in school? What have you done to meet these standards? 151. What do you expect to be doing in five years? Ten years? 152. What motivates you to put forth your greatest effort? 153. What short-term goals and objectives have you established for yourself? 154. What specific goals have you established for your career? 155. What specific goals, including those related to your occupation, have you established for your life? 156. What will it take to attain your goals, and what steps have you taken toward attaining them? 158. Give me an example of a project you started on your own. 159. Tell me about a time when you went above and beyond to solve a problem or do something for the company. 160. What initiatives have you started in the past year? 161. Tell us about a problem that you solved in a unique or unusual way. What was the outcome? Were you satisfied with it? 162. Tell us about a suggestion you made to improve the way job processes/operations worked. What was the result? 163. There are many jobs in which well-established methods are typically followed. Give a specific example of a time when you tried some other method to do the job. What was the result? Did others adopt your new method? 164. Give me an example of a time when you developed an out of the box solution. 165. Tell me about a time when someone asked you to do something you didn’t agree with. What happened what did you do about it? 166. At times we are all confronted with dishonesty in the workplace. Tell me about a situation where you had to deal with dishonesty and what you did about it? 167. Tell me about an ethical or fairness issue you have had to deal with. 168. Do you trust your gut in decision making or rely more on the facts and figures? 169. How would others describe your decision making style? 170. Give me an example of a decision you made that in hindsight you wish you had reconsidered. What did you learn from it? 171. Describe a situation where you had to exercise a significant amount of self-control. 172. Tell me about a time when you had to produce results without guidelines. Give me examples. 173. Give me an example of a time when you had to take charge of a situation that was going off track. 174. Give me an example of your ability to build enthusiasm in others at work. 175. What is the toughest group you have ever had to work with? 176. Give an example of how you demonstrate to a client or customer that you are listening carefully? 177. What types or work have you done in the past that required careful listening? 178. Give me an example of a time where directions or an objective was misunderstood, what happened, what did you learn? 179. Describe a situation where you were able to get a team past a problem. 180. How do you define success in your career? 181. How do you get others to work at a higher level? 182. How do you motivate others to go above and beyond? 183. Give me an example of something you did to motivate a team. 184. Tell me about a team-building exercise that motivated the team to outperform. 185. How many projects do you typically work on at once? 186. Give me an example of a time when you had to pick up the slack for someone else and do their job as well as yours. How did you manage? 187. How do prioritize which projects to work on at which time? 188. Describe the most challenging negotiation you have ever been a part of. 189. Sometimes in a negotiation its best to walk away, tell me about a time when you couldn’t reach a deal on an important negotiation and you made the decision to walk away. 190. Have you ever had to bargain with someone? 191. Tell me about a time when you had to negotiate, perhaps at a flea market. Walk me through what happened. 192. What is the most challenging part of a negotiation for you? 193. How did you approach the last time you wanted a raise? 194. How do you determine your opening position in a negotiation? Look for considering the others point of view. 195. How do you take into account the other person’s position in a negotiation? 196. How do you keep track of how you spend your time? 197. What do you do when you are working on a project and you are interrupted? Give examples. 198. How do you determine what gets top priority when scheduling your time. 199. How do you organize your music collection? 200. Explain the activities that you do to control stress. Getting started on projects, particularly if things are busy, is often difficult. Describe the last situation where your manager thought you did not get started on a project quickly enough. 201. How do you determine priorities in scheduling your time? Give examples. 202. Describe a time in school when you had many projects or assignments due at the same time. What steps did you take to get them all done? 203. Tell me about a time you had to handle multiple responsibilities. How did you organize the work you needed to do? 204. Would you say that you can easily deal with high-pressure situations? 205. Establishing a course of action for yourself (and/or others) to accomplish specific goals. Planning proper assignments for personnel and appropriately allocating resources. 206. How do you determine priorities in scheduling your time? Give examples. 207. Describe a situation that required a number of things to be done at the same time. How did you handle it? What was the result? 208. Describe a time when you were faced with problems or stresses that tested your coping skills. 209. Describe the system you use for keeping track of multiple projects. How do you track your progress so that you can meet deadlines? How do you stay focused? 210. Tell me about a stressful situation that you experienced at work. How did you handle the situation? 211. There times during the workday when you may want to do things in a meticulous way (that may take extra time), and other times when you must reach a solution in the quickest possible way. Which situation do you prefer and why? 212. Describe work circumstances that are sometimes boring. 213. Give me an example of a time with a coworker was not pulling their weight. What did you do to get things back on track? 214. How do you coach a subordinate to develop a new skill? 215. Tell me about a performance review where you had to tell someone they were not doing a good job. 216. Give me an example of a time where you were not being effectively managed. What did the manager do that was ineffective? What did you do about it? What was the outcome? 217. How often do you feel it is necessary to conduct performance reviews? 218. Tell me about a situation when you had to take disciplinary action with someone you managed. 219. Tell us about a time when you had to tell a staff member that you were dissatisfied with his or her work. 220. Tell us about a time when you had to use your authority to get something done. Where there any negative consequences? 221. How do you like to receive feedback? 222. How do you give feedback to others? 223. Sometimes it’s best to deliver feedback differently to different people, how have you adapted your feedback style to cater to different types of people? 224. Describe a situation where you had to persuade others to see your point of view. 225. Tell me about the most common objections you have had to deal with in past sales or influencing situations. What is your process for overcoming the objection? 226. Do you feel most comfortable selling tangible products or things, or intangible services? 227. Tell me about a situation where you had to persuade a group to accept a proposal or idea? 228. Tell me a story that you have used to sell your company or services? 229. Tell me about a time when you used facts or data to help persuade someone to see your point of view. 230. Tell me about a complex project that you had to plan out? How did you manage the execution? 231. How do you account for unforeseen circumstances when planning a complex project? 232. How do you go about setting performance plans or sales plans for others? 233. Tell me about the biggest presentation you have ever delivered? 235. Tell me about the most effective presentation you have ever delivered. What was the topic, what made it effective? 236. What kinds of presentations have you participated in? Online, telephone, in person. What is your best presentation platform? Why? 237. Tell me about the best presentation you have ever seen, what made it great, what have you done to improve your presentations as a result? 238. Can you tell me about a complex problem that you solved? Describe the process you utilized. 239. Tell me about an unforeseen problem that you encountered in an important project. What happened? 240. Describe the most innovative thing you have done to solve an employee’s problem. 241. Do you prefer to solve problems independently or as part of a team? 242. Describe your preferred problem solving method. 243. Tell me about a situation where you had to mediate a resolution between two people or groups that didn’t agree. 244. Tell me about a time when you had to facilitate a creative solution. 245. Tell me about a time when you had a conflict with another employee, how did you deal with it? What was the result? 246. Give me an example of a situation where you were not able to resolve a problem. What happened, what actions were taken or not taken as a result? 247. Sometimes we just can’t come to a resolution on a situation, tell me about a time when you had to manage a hostile or challenging relationship with a coworker as a result of an unresolved issue. 248. Tell me about a time when you had to keep personal feelings out of a work related issue, what happened? 249. Tell me about a time when you remained calm and worked towards a solution when you were very angry with the other party. 250. Describe a work situation in which you had to take a risk. What was the outcome? 251. Give an example of a time in which you had to be relatively quick in coming to a decision. 252. Give me an example of a bad decision that you made and what you learned from that mistake? 253. Give me an example of a time when you had to make a split second decision. 254. Tell me about a time when something you tried to accomplish and failed. What did you learn from that failure? 255. Tell me about a time when you had to make a decision, but didn’t have all the information you needed. 256. Tell me about a time when you missed an obvious solution to a problem. What did you learn from that mistake? 257. Tell me about the riskiest decision that you have made. What were your considerations in making that particular decision? 258. How would you rate your career success thus far? 259. What is your greatest disappointment? 260. What is the most useful constructive criticism you have ever received? 261. What things are you doing to improve your personal success? 262. Give me an example of an important goal that you set in the past? 263. Tell me about a situation where you did not achieve a goal. What happened what did you do to course correct? 264. What do you consider to be your greatest professional strengths? How have you used this attribute to your advantage in the workplace? 265. Sometimes we all get overloaded. How do you prioritize your time when you get in over year head? 266. How do you manage your time? 267. How do you approach a challenging or complex project? 268. How do you set priorities? 269. Describe your three greatest accomplishments to date. 270. What has been your most rewarding accomplishment? How was that recognized? 271. Give me a specific example of something you did that helped build enthusiasm in others. 272. Give me an example of a time when you came up with a unique way to achieve a goal. 273. How would you describe strategic thinking? 274. Give me an example of a strategic decision you came up with on your own. 275. What do you do to blow off steam when you get frustrated? 276. How do you manage stress? 277. What types of things cause you the most stress? 278. How do you recharge your personal battery? 280. Are you more energized by working with data or by collaborating with other individuals? 281. Describe a time when you put your needs aside to help a co-worker or classmate understand a task. How did you assist him or her? What was the result? 282. Recall the situations where you had little time to get out and work with your team members. What problems are associated with that? 283. Tell me about your role in a project team. What did you do to contribute toward a teamwork environment? Be specific. 284. Can you tell me about an occasion where you needed to work with a group to get a job done? What were the challenges and difficulties and how did you face these? 285. Tell me about a challenge that you successfully met. 286. Tell me about a time when you had to leverage the strengths of others to accomplish a goal. 287. Have you ever participated in a task group? What was your role? How did you contribute? 288. What is your preferred role in a group? 289. Do you prefer working in a group or on your own? 290. Tell me about a time that you had to work on a team that didn’t get along with each other. What happened? What role did you take? What was the result? 292. Tell me about a time when you had to work in a new team. How did you get to know the other team members? 293. Describe the most challenging team situation that you ever had to deal with, What was the single most effective thing you did to move the team towards their goal? 294. What feedback have you received after being part of a team? What have you done to act on that feedback? 295. Describe a situation where you were working in a dysfunctional team. What made it dysfunctional? What did you do about it? 296. Describe a situation where you had to plan out a complex trip or event schedule. 297. What is the most challenging thing you have ever had to schedule? 298. How do you manage your time? 299. How do you keep track of where you spend your time? 300. What are your personal values? 301. What do you do when someone asks you to go against one of your values? Interested in downloading a copy of this list? Download a PDF copy below. 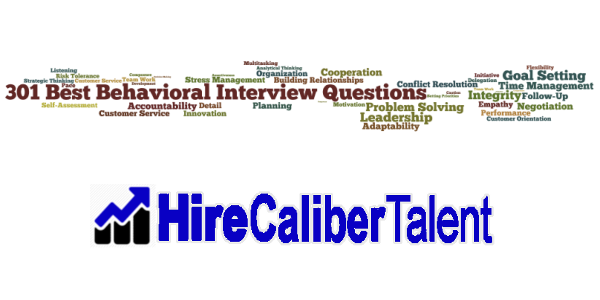 Do you have a great behavioral interview question that should be added to the list? Please share it in the comments section below.